The supply of newly completed residential properties in Malaysia rose only 2.2% last year, a drastic slowdown from the 3%-12% range seen since 2001. Those with a budget of half a million ringgit can still purchase decent landed residential properties that are not too far away from the Kuala Lumpur city centre, particularly in the Ampang area. A search through the online property listing of Metro Homes Sdn Bhd turned up several interesting possibilities including a leasehold two-storey terrace house (five-bedroom/three-bathroom, on a 22ft x 75ft lot) going for RM500,000 in Taman Sri Watan, Ampang. Also available was a leasehold three-storey terrace house (six-room/three-bathroom, on a 1,200 sq ft lot) going for RM470,000 in Taman Muda, Ampang Jaya. A search via StarClassifieds also turned up a two-storey terrace house (three-room/three-bathroom), said to be located near the Kelab Darul Ehsan golf course, going for RM520,000 in Taman Tun Abdul Razak, Ampang. There are also two-storey terrace houses selling in the RM500,000 bracket on the secondary market in Pandan Indah, Kuala Lumpur and Taman Ehsan, Kepong. The online Metro Homes listing also showed options in Petaling Jaya including a a freehold one-storey intermediate terrace house (three-room/one-bathroom, on a 1,650 sq ft lot) going for RM455,000 in SS5. Also offered was a leasehold Merdu Idaman one-and-half storey townhouse (four-room/four-bathroom, built-up of 1,800 sq ft) going for RM500,000 in Jalan Seroja, Kayu Ara, Petaling Jaya. Our search also turned up a partly furnished freehold two-storey terrace house (six-room/three-bathroom, on a 22ft x 85ft lot) going for RM500,000 in SS14, Subang Jaya. A report by C H Williams Talhar & Wong (WTW) issued in March this year, noted that due to limited supply of land, the development of the landed residential sector has shifted farther away from the Kuala Lumpur city centre. “Last year, selected areas within Seri Kembangan, Puchong, Kinrara, Kota Damansara, Kepong became the hotspot areas for landed residential housing. Gated and guarded types of landed residential properties emerged as the popular trend in the Klang Valley,” says the report. A recent CIMB Research report pointed out that last year, bungalows in Kuala Lumpur saw a 19% increase in prices, followed by semi-Ds at 16.7%. The CIMB Research report noted that the strong property price appreciation for all residential properties was due partly to limited new supply last year, which had increased at the slowest pace since 1997 particularly in the Klang Valley, Johor and Penang. “The supply of newly completed residential properties in Malaysia rose only 2.2% in 2010, a drastic slowdown from the 3% to 12% range seen since 2001,” said the report. This could be one reason for the spike in the prices of landed terrace residential units in recent years in Klang. IOI Properties recently launched freehold two-storey terrace houses (priced from RM468,800 on 22ft x 70ft lots) in Bandar Puteri, Klang. These are still more affordable options compared with Bandar Setia Alam, Shah Alam (located off Jalan Meru, Klang) where in early June, SP Setia Bhd launched freehold two-storey cluster houses (30ft x 55ft) priced from RM568,000. It should be noted that renovated and partially furnished freehold two-storey terrace units (22ft x 75ft) in gated and guarded precincts within Bandar Setia Alam were transacted on the secondary market in the region of RM600,000 this year. Also, on the secondary market, freehold and basic two-storey terrace units (22ft x 75ft) can be found in Putra Heights (adjacent to Subang Jaya) for about RM500,000. Meanwhile, those desiring bigger-sized homes can check out bungalows in Rawang. On the Metro Homes listing was a freehold two-storey bungalow (five-room/four-bathroom, on a 3,500 sq ft lot) going for RM510,000 in Taman Sri Hijau, Rawang. Another option was a freehold fully-furnished two-storey bungalow (five-room/four-bathroom, on a 50ft X 80ft lot) going for RM450,000 in Bandar Country Homes, Rawang. LBS Bina Group Bhd, which is working towards developing more premier property projects, will launch D’Island Residence in September. Located on 175 acres in Puchong, the development will comprise 237 super-link houses, 298 semi-detached homes, 148 bungalows and 352 high-end condominiums as well as two blocks of commercial units. Managing director Datuk Lim Hock San says the project, with a gross development value (GDV) of RM3.5bil, will also feature a commercial hub. It is expected to take five to seven years to complete, he says. Lim says D’Island Residence will be developed based on the tagline Island Retreat, Urban Charm and will promote modern lifestyle living. It will have a clubhouse and adopt environment-friendly features like rainwater harvesting system and light-emitting diode street lights. At the soft launch of D’Island Residence in April, 71 super-link houses worth RM83.4mil were sold. The latest launch today will feature 74 semi-detached houses priced from RM2.38mil. Lim says the development is projected to contribute 30% to 40% to the group’s revenue and earnings over the next few years. “We are transforming LBS to move up the value chain to focus on higher priced products,” Lim explains. Houses priced above RM350,000 will constitute 60% of those that will be built by LBS this year. For the past five years, abouts 90% of the company’s sales came from medium-low to medium-cost homes. Lim says LBS will adopt more green technology and designs in its projects. As part of its long-term initiative to focus on high-end residential property market, Lim says LBS will launch a re-branding exercise later this month. LBS has engaged alpha245, the brand communications subsidiary of Leo Burnett, to provide professional advice and guidance on the exercise, Lim says. “LBS is also improving on customer experience and the quality of its products,” Lim adds. Known for building affordable homes, the company plans to focus on medium-high to high-end market segment to earn better profit margins. Lim says LBS is targeting sales to hit RM650mil this year from RM422mil last year. He expects sales to reach RM800mil in 2012 and RM950mil in 2013. As at May 31, the company has unbilled sales of RM527mil, which will be realised over the next two years. Lim says LBS will continue to build affordable homes priced below RM350,000, albeit on a smaller scale. The company has been building affordable homes at Bandar Saujana Putra, its flagship development spanning over 835 acres in Selangor. 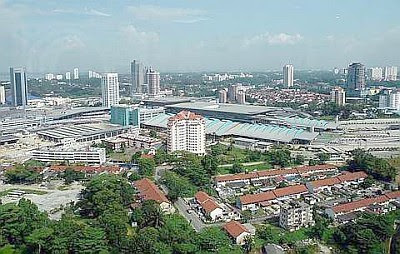 The self-integrated township was launched in February 2003 and has a GDV of RM3bil. Sales of RM850mil have been recorded so far. LBS has handed over about 5,000 units of various types of properties in the township. Johor Baru city skyline and the city which is located within Iskandar Malaysia economic growth corriodr will benefit from the influx of local and foreign investments. EARLY last year, UEM Land Holdings Bhd CEO and MD Datuk Wan Abdullah Wan Ibrahim brought up the high aspirations he has for the company and Iskandar Malaysia. He told StarBizWeek that he aspires to make UEM Land Holdings Bhd a global property development outfit the likes of Singapore's CapitaLand. “We hope to one day play a similar role in Khazanah be what CapitaLand is to Temasek. We recognise that we are a relatively small player compared to the highly diversified property player like CapitaLand,” Wan Ibrahim said when talking about the plans he has for southern Johor economic region. The time for Wan Ibrahim to make that aspiration a reality has come. Early this week, Khazanah Nasional Bhd issued a joint statement with Singapore's Temasek Holdings Pte Ltd to develop RM30bil worth of real-estate projects in Singapore and Iskandar Malaysia, which is located in the southern part of Johor. It will be the largest property joint venture between the investment arms of the two governments to date. The implications are many and far reaching. Iskandar Malaysia is Khazanah's largest property investment, while UEM Land is its property flag bearer. UEM Land is the master developer of 9,713ha Nusajaya township. Singapore-based CapitaLand Ltd, on the other hand, is South-East Asia's largest property company in terms of market capitalisation, with sprawling assets and interest throughout the region. It is one of Temasek's portfolio company in the real estate sector. The other portfolio company in the same sector is Mapletree Investments Pte Ltd.
“Iskandar Malaysia, by itself, is essentially Johor Baru, three ports and a domestic airport. Iskandar Malaysia plus Singapore is a different equation altogether. We are then have the additional Jurong and Port of Singapore Authority and Changi International Airport, which connects to over 200 destinations worldwide, with 5,000 arrivals and departures a week by 80 international airlines. In terms of banking and services, it is second to none in the South-East Asia region,” Wan Ibrahim says. All that connectivity and infrastructure will be there for the state of Johor to leverage on, with sovereign backing from both sides. UEM Land will not only be working with CapitaLand, it will also be working with Mapletree Investments Pte Ltd, another portfolio company in real estate development. Two new joint-venture companies, M+S Pte Ltd and Pulau Indah Ventures Sdn Bhd, for joint-development projects in Singapore and Iskandar Malaysia respectively, have been established. In an e-mailed statement, Wan Abdullah says Sunrise MS Pte Ltd, UEM Land's indirect wholly-owned subsidiary has been appointed together with Mapletree Investments to oversee the development and marketing of four land parcels at Marina South, located at the heart of the financial and business cluster in Singapore's Marina Bay area with a total permissible gross floor area (GFA) of 341,000 sq m.
In addition, UEM Land and CapitaLand have been appointed to oversee the marketing and development of two land parcels in Ophir-Rochor, located between the Kampong Glam Historic District and the Beach Road Conservation Area with a total permissible GFA of 160,020 sq m.
The development at these two sites totalling 501,020 sq m, will include office, residential, hotel and retail components with a total estimated gross development value of approximately S$11bil (RM27bil), subject to design and development plans. “We have the expertise to undertake these two projects and are thus excited to be involved in the development of these two key sites in Singapore. We view this as an excellent opportunity to familiarise ourselves with the Singapore market and regulatory framework, in line with our aspiration to expand to regional markets. “Our appointment also allows us to establish a close working relationship with two leading real estate companies from Singapore and I view the appointments as win-win for both parties for not only are we able to learn from each other but it also provide a platform for future collaborative opportunities both in Nusajaya and elsewhere.” says Wan Ibrahim. It is an opportunity that other Malaysian developers would give a leg and an arm for. 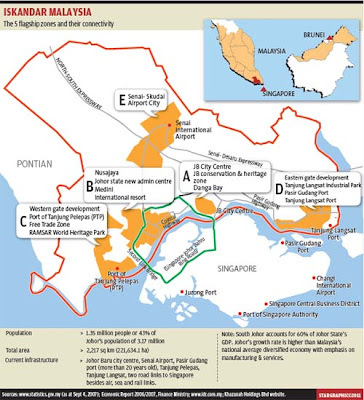 The last several years, Malaysian developers have been making forays into the city state. These include YTL Land Bhd, sdb Properties Sdn Bhd, the Sunway group, SP Setia and GLC Sime Darby group. With land prices so steep by comparison, one has to have deep pockets and a deep confidence that there will be demand for their offerings. In the case of UEM Land, the prize literally landed on them. RAM Holdings group chief economist Dr Yeah Kim Leng views the cooperation very positively. He says from the economic perspective, the synergies when Khazanah and Temasek pool their resources and capital to jointly undertake investments in the two countries will enhance the potential of their investments considerably. The positive spillover arising from the collaboration will be that a lot of things will be fast tracked. There is also a greater chance for success given their sovereign backing from the respective governments. “It will go beyond real estate to attract other business ventures to enter Iskandar. The positive effect for UEM Land and Iskandar is greater because some of Singapore's excess capacity can be relocated to the Malaysian side given our large land resources. UEM Land will be able to upscale themselves. This is one of the benefits of the JV,” says Yeah. Despite the difference in size Iskandar Malaysia is three times the size of Singapore Yeah says there is much opportunities for UEM Land, Iskandar Malaysia. “The positive effects of this JV goes beyond property development, UEM Land. It will broaden and deepen Johor's economic base. “Regionally, there is greater integration from the perspective of the Johor-Singapore region and well as the greater Asean region. With China and India having their huge population to generate demand, this is an opportunity and a catalyst for Malaysia and Singapore and Asean to generate demand. Malaysia will be benefit more because our absorption capacity should be greater and some of the excess capacity from Singapore can be relocated to the Malaysian side,” he says. The positive effects of the tie-up has already spill over to the private sector. A day after the Khazanah-Temasek announcement, Eastern & Oriental Bhd (E&O) issued a statement it will be partnering both state investment arms to develop an 84ha mixed development dubbed as a wellness township in Nusajaya, Johor. E&O's unit Galaxy Prestige Sdn Bhd has set up a 50:50 joint-venture company, known as Nuri Merdu Sdn Bhd, with Pulau Indah Ventures Sdn Bhd, a 50:50 venture between Khazanah and Temasek. E&O deputy managing director Eric Chan says in a e-mailed statement that the targeted GDV is estimated at approximately RM3bil and the actual figure will be dependant on the final masterplan. The infrastructure works have already started and targeted for completion by end of this year. Depending on market conditions, this project should last us between five and 8 years. Says Chan: “The term wellness' is a broad concept that encompasess the well-being of the overall body, mind and spirit. Our consultants and architects are setting out to weave “wellness” elements into the masterplanned development with a view towards providing a quality lifestyle that enriches the well-being of residents. Work on the master plan will be completed by the end of this year, the next stage is getting approval from the authorities, he says. Prior to this, the lifestyle property developer signed a partnership agreeement with Japan's Mitsui group, Mitsui Fudosan Co Ltd, to jointly develop residential properties in Malaysia and the region. Chan says their venture into Iskandar with Pulau Indah Ventures Sdn Bhd has no connection with the Mitsui Group but an analyst says the recent developments will be synergistic for the Penang-based developer. “They can sell their Iskandar, Penang and Kuala Lumpur projects,” says RHB Research Institute senior property analyst Loong Kok Wen. She says up to this point, E & O is the only Malaysian developer working with CapitaLand in Khazanah-Temasek venture. GARDENERS all over Malaysia know of Sungei Buloh as the hub of horticulture in Malaysia. Centred on the grounds of the old leprosy hospital and settlement, Sg Buloh has, in the past 50 years, become the place to see what is new and available in garden plants. In the early years of the 20th century, lepers were sent into exile to islands such as Pangkor Laut and Pulau Jerejak. In 1930, the hospital and settlement in Sg Buloh were established by the government of British Malaya to serve as a central facility to treat and house leprosy patients and the island settlements were gradually closed. The patients lived in simple one-room duplex houses with a bit of land around each house on which they could grow vegetable and keep chickens. The patients and their families had practically no prospects of getting out and re-integrating with society at large. By the 1950s the doctors were confident that leprosy had been beaten medically, but social acceptance of cured patients posed a huge problem. Then John Wyatt-Smith of the Forest Research Institute at Kepong a few miles down the road decided to do something about it. He arranged for about 30 able-bodied men from the settlement to be employed at the institute (now Forest Reserve Institute of Malaysia or FRIM). This was no small undertaking. No other organisation was willing to offer employment. FRIM was able to take the lead because John Wyatt-Smith was such a respected and towering figure at the institute and the forest department. When I joined FRIM in 1964, Wyatt-Smith had just retired, but the men from Sg Buloh had become indispensable. They did all the toughest jobs, moving heavy loads, felling trees, clearing land, and looking after the plant nursery. In the process they earned the respect of their co-workers. Those not employed by the institute were encouraged by the hospital to take up the growing of ornamental plants, to sell by the roadside in front of their houses. Slowly overcoming their fears, people in KL began to go to Sg Buloh to buy plants, because such plants were cheap compared with elsewhere. In the 1970s, the hospital organised a garden show, in which Lam Peng Sam and I were the judges. My nurseryman at FRIM was Mat Isa bin Bulat. He died a few months ago, by then a highly successful businessman and living in a big bungalow in Sg Buloh. As a youth in Langkawi, Mat Isa's world crashed when he was diagnosed with leprosy. Sent to Sg Buloh for treatment, he was one of those selected to work in FRIM. I was at that time making an encyclopaedic survey of fruits, seeds and seedlings of forest trees. This work would eventually be published in two thick volumes and become the reference textbook for those in the business of raising forest trees. At that time no such business existed. Mat Isa looked after the hundreds of species of forest trees that I was raising, learning to recognise all the plants and their names. He learnt not only their Malay names but also their scientific names (Greek and Latin to most people) from the labels I attached to the plants. Then one day, he shocked everybody by announcing his resignation to go into business. Kuala Lumpur was taking up urban greening in a big way and there was a willingness to try new species of trees from the forests. Mat Isa saw his opportunity. He could recognise and name hundreds of species of forest trees by their local as well as their scientific names. He rented land from his neighbours to set up nurseries in Sg Buloh, and was able to supply the growing demand. I did not know how he was progressing until some years later when he overtook me on the on road to FRIM and waved cheerily. He was driving a Mercedes while was I driving my Datsun. On another day, while having a drink with him in a kopitiam he told me how he had just lost a large sum of money. It was stolen from his car when he had stopped for lunch after withdrawing the money to pay salaries. It was something like RM 20,000. Did you report to the police?' He merely shrugged and said “what's the point”. I guess when one has been through what Mat Isa has been through, the loss of RM 20,000 is not such a big disaster. Over the years, Sg Buloh has become the centre of a highly innovative network of self-made men and women engaged in the horticultural business in Malaysia. This network keeps thousands of people employed, not only in Sg Buloh but also in feeder nurseries outside KL, and as far as Cameron Highlands and Muar. New flower varieties are usually first offered in Sg Buloh before they appear elsewhere. From its original hub at the hospital area, flower nurseries have been established in the surrounding area. Sg Buloh provides a good example of how the best commercial or industrial hubs come into existence organically' through time. It requires the interaction of many individuals, in unique ways, in some unique place. Such a hub can be easily destroyed but not easily duplicated elsewhere. As an example of how planned hubs can fall short, we have the so-called green lane' on the road from the Sg Buloh junction to the Rubber Research Institute. All along one side of the road, the land has been divided and let out to nurseries, but such nurseries are strung out for several miles, and the road has become a noisy, busy highway. It is unpleasant to walk from one nursery to the next and dangerous to park and re-park on the roadside. It is also impossible to turn back. At the historic hospital hub, one can visit a large number of different nurseries within a small area, in peace and quiet. Now that leprosy and been beaten and its hospital relegated to history, the horticultural hub and its historical buildings, especially the one-room duplex houses, survives as a reminder of a huge human tragedy overcome by human determination. The Malaysian horticulture industry will suffer a serious setback if its Sg Buloh hub is lost. The involvement of the Malaysian and Singaporean governments in the development of real estate in Johor and Singapore is significant in more ways than one. It is not only a move that harnesses the benefits to be reaped from real estate development in both countries; there is also the political side of it, besides the social aspect. The following may not be the best analogy, but it does sum up the relationship between the two countries. Imagine two lads from different countries, with no political, historical and economic baggage, coming together to build sand castles on the beach. It could be a beach in Singapore or Johor. There is healthy competition and both lads benefit from their time together. You watch how I build, and I watch how you embellish your sand castles. Who will build the most impressive sand castles? Who gets to use the spade and pail first, if there is only one spade and one pail? These are little things, but sometimes little things can blow up to big ones and friendships are lost in the process. Iskandar Malaysia, Marina South and Ophir-Rochor are the beach. Iskandar, by itself, already has a lot of superlatives. It is the first of several economic zones being promoted by the Government and so far, it has been the most successful, although it did not have an effervescent start in 2006. At 2,217 sq km, it is three times the size of Singapore. It is Khazanah Nasional's largest property investment. This joint venture (JV) between the two governments will make this RM30bil real estate development one of the biggest in Malaysian real estate. Khazanah, incorporated in 1993, has investments in banking, steel, power, infrastructure, real estate, telecommunicaitons, healthcare and port development. The guardians of Iskandar Malaysia could not be more illustrious. The Prime Minister and the Johor Mentri Besar are co-chairmen, and they are advised by the Iskandar Development Regional Authority (Irda). Established in 2007, Irda is the agency that regulates, plans, promotes and strategises Iskandar Malaysia's growth. The corporate motor that drives it is Khazanah, whose managing director, Tan Sri Azman Mokhtar, sits on the Irda board. There are two other GLCs involved in Iskandar, Iskandar Investment Bhd (IIB) and Danga Bay Sdn Bhd. Let's go across the causeway. The personalities behind Temasek is no other than Ho Ching, who is executive director and CEO. She is also the wife of Singapore premier Lee Hsien Loong. At one time, Ho Ching was ranked third among the world's 100 most powerful women. Incorporated in 1974, Temasek Holdings is an Asia investment company headquartered in Singapore. Temasek owns a diversified S$186bil portfolio as at March 31, 2010, concentrated principally in Singapore and the emerging economies. Temasek's investment covers a broad spectrum of industries: financial services, telecommunications, media and technology, transportation and industrials, life sciences, consumer and real estate, and energy and resources. Personalities aside, Singapore is one of the most vibrant economies in South-East Asia and our closest neighbour geographically. Our political and social ties go back a long way. In terms of infrastructure, financial services, logistics, the city state is far ahead. In terms of real estate, its properties command a higher value than Malaysia's on a per sq ft basis. Residential developments in district 9 and 10, considered as prime areas around Orchard, are priced between S$2,000 and S$3,000 per sq ft. In less prime areas, it is about S$1,200 per sq ft. Our KLCC condominium prices have not come up close to that range; it is instead very project specific, from RM1,000 to RM1,800 per sq ft. Average prices for high-end condminium development in Johor Baru is about RM500 per sq ft. In the rental market, while the occupation cost (gross rental rate) for prime office space in KL City Centre range between RM6 and RM8 per sq ft (psf), the cost in Singapore range between RM25 and RM30 psf. In Johor Baru, where most of the buildings are more than 10 years old, the current rental rate range from RM1.40 psf to RM3 psf. The low rental market in Johor Baru is hardly surprising as it is mainly domestic-demand driven. Valuers are indignant when asked to compare Johor Baru prices with the city state. It is not possible to compare the two. With property prices having escalated so much in Singapore, Iskandar offers an alternative. When the Iskandar idea was first mooted, the target audience were Singaporean investors. The city state's presence, in the form of Temasek and its portfolio companies like CapitaLand and Mapletree will lend credence and confidence to Singaporean investors, both large and small. Assistant news editor Thean Lee Cheng hopes this JV will be another oppportunity to cement ties. KUALA LUMPUR: Magna Prima Bhd will embark on its maiden overseas venture in Melbourne, Australia, with a proposed A$210mil development, Dynasty Living. The company said in a statement the 25-storey, single-tower apartment project would be built on a 2,700 sq m site. It will feature 320 units, inclusive of one to three-bedroom apartments, and a two-storey penthouse. Construction is expected to commence in the fourth quarter and the development is expected to be completed in 2013. Kuala Lumpur: An eleventh hour court ruling yesterday barred Sunway Real Estate Investment Trust Bhd (SunREIT) from taking possession of the Putra Place located opposite Putra World Trade Centre. The Court of Appeal yesterday granted a stay of execution on an order made by the High Court on June 28 2011 which declared SunREIT as the true owner of Putra Place. SunREIT was to move into the premises and take possession and control within 72 hours or at noon yesterday. OSK Trustees Bhd, acting on behalf of SunREIT, had on March 30 2011 bid and won the building that had been put up for auction. The Putra Place, which houses The Mall, an office complex, and the Legend Hotel, was auctioned off by Commerce International Merchant Bankers Bhd to recover loans given to property owner Metroplex Holdings Sdn Bhd. Metroplex is claiming that SunREIT is not the registered owner and wants to nullify the public auction. Following the High Court decision in favour of SunREIT, the previous owner filed a notice of appeal. SunREIT, as the registered owner, moved into the mall and set up a management office in a vacant lot. But it could not move into the hotel until it obtained a licence to operate the hotel. Its hotel licence was effective from yesterday. Yesterday morning, Metroplex went to the Court of Appeal to seek a stay of the execution order granted by the lower court pending its appeal to the Court of Appeal and a July 7th date was fixed for hearing. But shortly after, SunREIT solicitors were told the matter would be heard at 4pm. Meanwhile, SunREIT was allowed to enforce the order with the assistance of the police in case Metroplex failed to hand over the control and management of the property. Some 30-odd police personnel were at Putra Place yesterday. At around 11.40am, some 15 Sunway management team were briefed on what the next course of action would be, including the process of entering into the hotel premises. At around 12.20pm, reporters were informed that Metroplex's request for a stay would be heard at 4pm. Pending the decision, the management decided not to take possession of the building. A Sunway Hotel van carrying support staff for the hotel were told to turn back. They returned later in the evening and were identified as operations personnel. This group was briefed and was on standby should there be any hotel employees (under the Legend hotel management) walking out. The hotel had to run smoothly to avoid disruption to guests staying at the hotel. SunREIT solicitors will try and expedite the hearing of the appeal at the Court of Appeal.